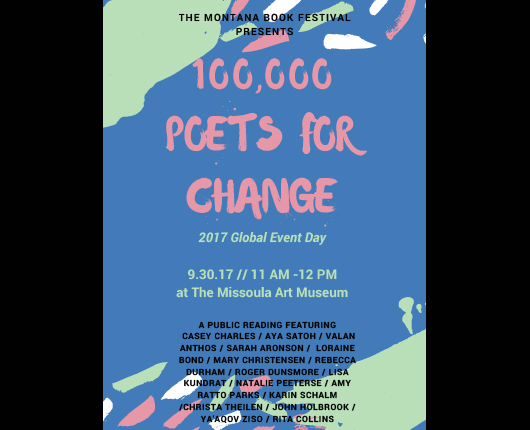 The University of Montana Creative Writing Program and Montana Book Festival, along with 100 Thousand Poets for Change, will host a poetry reading from 11 a.m. to noon Saturday, Sept. 30, at the Missoula Art Museum outdoor park, located at 335 N. Pattee St.
MFA students in the Creative Writing Program at UM have curated the Missoula event, selecting a diverse group of readers from the submissions. The selected poems all revolve around the theme of change. Since 2011, 100 Thousand Poets for Change has organized events around the world to promote peace, justice and sustainability. Sept. 30 is the organization’s “Global Event Day,” and poets around the world will read poems calling for positive change in social and environmental justice issues.